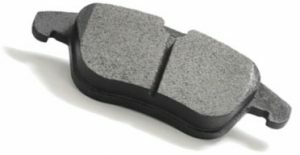 An automotive brake pad is an automotive component of a brake system. When the driver presses his foot against the brake pedal, two brake pads are clamped by pistons of onto a cast iron rotor, which rotate together with an automotive wheel, and slow the automobile by the generated force friction. A brake pad is prepared by attaching cured friction material cake, made from a resin compound reinforced with metal fibers, inorganic/organic fibers and more than 10 kinds of friction adjustment agents to an iron plate. Brake pads using copper metal fibers have been the main type for 20 years, thanks to their low noise when braking and well-balanced performance, and even in recent years the global market for brake pads using copper metal fibers are expanding. However, due to the negative impact on the environment, the development without the use of copper in the brake pads has become an urgent task for us. Each of GREEN LIGHT brake pads producer is actively involved in the research and development of copper-free friction materials. Through time copper-free friction material cake was develop and the zero copper brake pads was born. No performance problem was encountered with our zero copper brake pad, and neither friction coefficient nor wear resistance were inferior to those of conventional products. We are living in an age which we cannot talk about mentioning the environment. It is the same for the automotive industry, and we have to overcame difficult challenges in achieving both automotive performance improvements and environmental compliance simultaneously while rushing to comply with regulations imposed by each country. We will do our best and contribute to society better environmental compliance. …. and we chose in our brake pads !